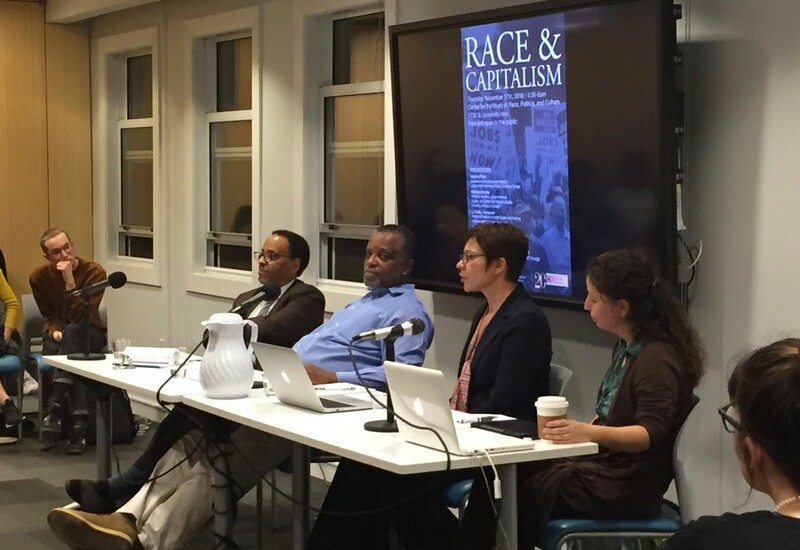 On Thursday, the Center for the Study of Race, Politics, and Culture (CSRPC) held the latest in its series of talks on the intersection of race and capitalism. The panel was moderated by Michael Dawson, director of the CSRPC, and comprised of Virginia Parks, professor of urban and environmental policy at Occidental College, J. Phillip Thompson, associate professor of urban studies and planning at MIT, and Kristy Ulibarri, assistant professor of English at East Carolina University. Thompson called the intersection of race and capitalism “very much undertheorized,” saying that the goal of the Race and Capitalism project is to point out areas needing additional research. He noted W.E.B. Du Bois’s description of the formation of a racialized police state as one example of work that has not been sufficiently developed since its publication. “Figuring how to entice white workers who were themselves oppressed, to be part of a system that oppresses them…that’s actually a challenging question. How do you do that? And so, giving them roles as police and military adjuncts of the system to supervise non-whites…that was part of the privilege that white workers were given. So, almost a century before Black Lives Matter, Du Bois was talking about how the very structure of capitalism created this role for poor whites policing non-whites,” he said. Parks built on Thompson’s depiction of domestic and agricultural workers as excluded from the benefits afforded other types of labor. “Those exclusions still stand in the United States. And often people think, oh, it’s a relic of the past, it was this deal with the devil that FDR had to make. But we have a new class of workers, mostly Latino migrant workers who are coming in and filling those two spaces in the economy, and they are bereft of protections,” she said. Ulibarri discussed examples of the intersection of race and capitalism in postmodern art. She brought up Sesshu Foster’s Atomik Aztex and the performance art piece Two Undiscovered Amerindians Visit the West by Guillermo Gómez-Peña and Coco Fusco. The artists traveled the world, posing in a cage as “undiscovered” natives from an island in the Gulf of Mexico. The audience reaction became part of the performance piece, as very few viewers objected to the actors’ apparent captivity. “For a dollar, [audience members] could hear a story. For five dollars, they could see Gomez pick his genitalia. People paid lots of money to do this. This is the ’90s; this isn’t that long ago. What’s scary is the majority of people thought this was real. They didn’t realize it was satire,” Ulibarri said.